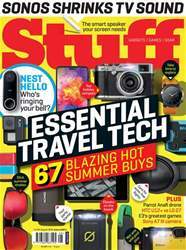 This months issue, we look at the best essentials to take with you on your hols, we also have a first look at the Sonos Beam soundbar, plus the latest TV from OLED masters LG and a first test of the Nest Hello smart doorbell. WIN A CANON EOS M50 CAMERA & 15- 45MM LENS WORTH £650! How low can you glow? THE BIG QUESTION HOW CAN I BECOME AN ECO-WARRIOR?